Here at Chicago Energy Consultants, we have always been eager to test, evaluate and implement effective energy saving products. Upon our first visit to the Energy Federation Incorporated (EFI) many years ago, we felt like kids in a candy store! So many products, so little time! Chicago's electric company, ComEd, has partnered with EFI to provide their customers discounts on select items, as well as a 10$ credit on your first order, if you complete a quick online energy audit. That's easy money, any way we look at it! In addition, the featured proudcts are at discounted at 20% off, and shipping is free for orders over 75$! Just for the holidays this year, every strand of LED lights includes a 2$ rebate from ComEd, as well! The Chicago blue bag recycling program has put friends of the environment through quite an emotional ride since 1995 when the program went city-wide; we toiled away filling blue bags up while sad truths regarding just where our recyclables did or did not go were revealed to us slowly over the years (the answer: mostly into landfills); as the powers that be insist that everything is working just fine. Alas, finally an end to the madness: announced this May in 2008 was the end of the Chicago blue bag program; the City has said that "by the end of 2011" the blue bag system will be replaced completely by the new 'Blue Cart' program. It would not be surprising if you had never seen a Blue Cart before, as only small portion of the city has them currently. They look just like the familiar black trash cans that are lined up and down every Chicago alley, but instead they are blue. 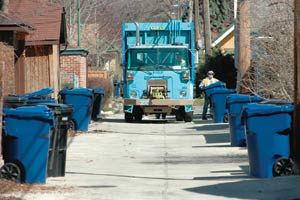 The Blue Carts by all reports are a resounding success, reducing the amount of waste by over 16% in the wards where they are available (so far in 2008, and the numbers keep going up), that's more than twice the effectiveness of the blue bag program's 8% (from the Chicago Tribune's 2005 estimate) . Sadly many communities will have to wait for years for the Blue Carts to appear, there is a map detailing when a few select neighborhoods will be receiving the blue carts, but a more speedy and complete roll-out of the carts is non-existent because of mayor Daley blaming budget shortfalls. It seems a bit short-sighted to not fund a project that can actually make money for the city as the prices of all recycled commodities go up and up.. a call to the department of Streets and Sanitation or the Mayor's Office asking them to put their money where their mouth is may help to spur things along. The Blue Carts will only serve smaller residential properties (homes and apartments with 4 or fewer units) known as low-density properties. Low-density residential properties create one-quarter of the waste the city disposes of, while the other three quarters of the city’s trash is generated by large residential buildings, offices, stores, restaurants, and other nonindustrial businesses, none of which are served by city garbage crews. High-rise dwellers or inhabitants in buildings with more than five units should know that city laws require that you must have a recycling program available to you. Please ask your trash carrier or condo board / association about compliance with the "Chicago High Density Residential and Commercial Source Reduction Ordinance" more commonly known as the Burke-Hansen ordinance. Keep in mind that while these programs might cost more money, with proof of a recycling program multi-unit buildings can receive a 75$ rebate per housing unit to recoup the property tax money the city collects for trash removal. Don't fall for the blue-bag trap again if your building's trash carrier says that is how it separates recyclables, insist that your carrier show reports of how much of the trash they collect is recycled, and contact your alderman to ask for assistance. The Chicago Reader has a great article on a high rise success story that actually decreased waste removal costs. For those without blue carts or multi-unit recycling initiatives, there is another option: the recycling drop-off centers scattered through the city. These are far from optimal since they force users to store their recyclables, then drive them to the big blue dumpster.. consuming precious space, gas, and time. But if you have a bit of extra room at home, you can fill your car for a trip to a drop off center. 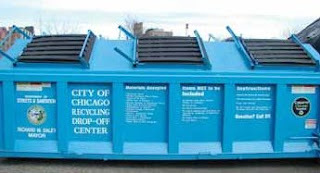 fantastic local resources are available, like the Chicago Recycling Coalition's website which offers easy access to a wealth of recycling information; or the Chicago Resource Center, where business can call for a pickup of items usually destined to the trash, which are then reused or stored and offered for use to teachers and other community programs at liquidation prices. 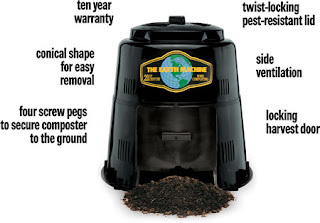 Stay tuned for future postings on how to cut trash collectors completely out of the equation for yard waste and other organic matter, by composting! It is almost that time of the year where the mercury climbs, and the city echoes with the buzz of air conditioners. These ubiquitous devices certainly make living in the summer heat more comfortable, but they can put quite a dent in the pocket book. ComEd's new electricity rates may have some folks particularly hot under the collar when their power bill arrives! There is a bigger problem at hand than high utility bills: on the hottest days of summer, electric system usage during peak hours can result in an overloaded generation system or delivery grid... and that can mean brownouts- or even worse- blackouts. Another interesting challenge that hot weather and its close cousin water shortage poses is that nuclear power plants actually have to reduce their power output during heat waves, or shutdown completely because of lack of cool water. Nuclear reactors use fission to heat water into steam, turning turbines that generate electricity, and then cool that steam back into water and feed it back through the core, repeating the process. Without lots and LOTS of water this system doesn't work. One reactor pumps 1 BILLION gallons a day of water through its cooling systems and back into waterways, other reactors (the type with the distinctive cooling stacks we all know from the Simpsons) can evaporate 17 million gallons a day into the air! Without adequate water supplies, reactors must drop energy output or shutdown. Illinois is a large user of nuclear power, but is at a lower risk of being affected by this type of issue than the southern states because our rivers and lakes are cooler, but don't think that when any reactor in the country shuts down unexpectedly that everyone's electricity rates won't go up! 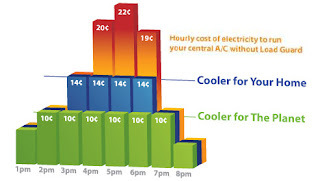 There are ways to avoid the cooling crunch: The easiest way to combat an overloaded grid, while still enjoying the same habits and lifestyle, is an air conditioner cycling system like ComEd's Nature First program. Depending on the program you select, ComEd will credit your bill either $5 or $10 dollars a month for 4 months (from the beginning of June, till the end of September) if you let them attach a small radio controlled switch to your central air conditioning unit's outside compressor. If and when demand cannot be met, or the grid is approaching a danger threshold, ComEd sends a radio signal that will turn off the AC compressor, but still allow your homes air circulation fans to run. The $5 a month credit will allow ComEd to cycle your compressor on and off every 15 minutes, while the $10 credit will allow for one continuous 3 hour block of time where the compressor is disabled. This program is only active during weekdays, and having been a user of the system for some years myself, I have never experienced more than 4 activations of the service in one year, and they tend to happen in the mid afternoon, when I'm not home anyways. The fact that most AC systems are oversized for the house they cool is another story, but running your air on and off for 5 minutes at a time is really horrible for efficiency! For the more flexible users of electricity, Illinois along with ComEd have pioneered a new and innovative program for residential users known as 'Residential Real Time Pricing' or RRTP. Under this program, you pay the hourly market rate for electricity, rather than the 'averaged' market rate. You can get a hint of the difference in how these these rates fluctuate by looking at ComEd's current residential 'Basic Electric Service' (or BES) rate sheet, where 'general lighting' costs 7.212 cents/kWh while 'dusk to dawn lighting' costs only 2.760 cents/kWh. If you are thinking "so what, that's not that much difference", consider that I have saved more than $800 over the 5 years I have been on a Real-Time Pricing program, by simply thinking about how and when I use electricity, and making some small adjustments to my life! I was an early user of this program when it was still administered by the community energy cooperative, and it was known as the Energy Smart Pricing Plan, or ESPP. ESPP was wonderful because you knew what electricity rates were going to be for the day the evening before, and could plan your activities accordingly if rates were to be high. ComEd's current RRTP program uses a rate known as BES-H (residential-hourly), this pricing plan gives you an estimate of tomorrows prices, but you will only know what you are paying for that power as they day progresses; and sometimes what you end up paying is way off the estimated cost.. These prices change every 5 minutes, so good luck keeping up with them! Luckily, there is a service available for ComEd customers on the RRTP program, called Load Guard (open PDF). Load Guard lets you use the same AC compressor switch installed when enrolled in Nature First, and takes the concept a step further: if your electricity rates exceed a preset threshold of either 10 or 14 cents/kWh, your AC compressor is cycled on and off just like in the Nature First $5/ month program. (EDIT: The Nature First program has been renamed "Central AC Cycling" by ComEd, the link is now updated to take you to the new website). Sometimes the city makes it hard to find about upcoming programs and projects, it seems even more so the case with green initiatives! So, Chicago Energy Consultants will be posting event information as we receive it for city events and programs. UPDATE: New event info for 2008, please see this post! Please see this page for more information on Environmental Resource Events (although the page is currently only has information for the April 19th, 2008 event). Thank you for your interest in a Chicago Rain Barrel. We had an overwhelming turn-out at our first rain barrel distribution as part of the Environmental Resource Event at DeVry University in April, selling over 350 rain barrels! *Available while supplies last, limit 1 per household. **Available to City of Chicago residents only, proof of residency required at sale and available while supplies last. We know there is demand out there, so if we have another opportunity before that we will let you know ASAP. Your email has been added to our contact list, so please stay tuned. Below are other opportunities to purchase a rain barrel in the area. Thank you for your inquiry and interest in helping Chicago conserve water and manage stormwater. "The rain barrels are available in black and terra cotta (brick red) this year; however, the design is similar to last year in that they are formally food processing barrels ranging from 55-60 gallons." Rain Barrels are fantastic tools for anyone who has anything growing outdoors that needs watering. They not only help to reduce water consumption, but also reduce the runoff that occurs when Chicago's shared sewer system fills up or is stressed by rains. I have used a water barrel connected to a drip irrigation system and a timer to automatically water my vegetables as needed on my deck-top garden, and have had fantastic results! Please see this post for more information on this Environmental Resource Event! If you live in a building with no area to let overflow from your water barrel soak into the ground, I recommend using a downspout diverter. I have used the Garden Water saver, and though it once in a while it will clog (and no longer fill the rain barrel, but will still drain downspout water) it works pretty well. Your brand new finished basement has finally been completed. The kids finally have a place to play, the media room has the biggest flat panel on the block, and your new exercise area will help the whole family stay in shape. The sump pump has a battery backup, the walls are air-tight, what could go wrong? If you don't know your home's radon levels, consider that all the time you spend in the basement could be just as damaging to your lungs as sitting in a smoking lounge! Radon gas is an odorless, invisible radioactive gas that is produced by the natural process of radioactive elements in the ground breaking down. Radon is the second leading cause of lung cancer in America and claims about 20,000 lives annually. Radon is one of the heaviest gasses present under normal room temperature conditions. Radon's most stable isotope, radon-222, has a half-life of about 3.8 days. It decays into polonium-218 through alpha decay. Radon can be carried into your home through natural gas (think kitchen: range, oven). Most folks in Northern Illinois are not aware that they live in a medium to high risk area for radon exposure. See the image below for your area's risk level, (taken from the EPA's radon zonemap Red = "action" levels over 4 pCi/L (pico curies per liter); Orange = moderate risk at 2-4pCi/L; Yellow = low risk at under 2 pCi/L). The good news is that with some minimal effort, unsafe levels of radon can be detected; and if found, your home can be made safe from radon with minimal investment. It is important to test your home for radon, as levels vary greatly from home to home, and from season to season; even neighbors can have very different levels of radon. Generally speaking, the highest radon levels will occur when the ground is warm, and the lowest levels when it is frozen. Radon levels can even vary large amounts from week to week, so radon tests that take a longer time to complete (alpha-track counters that take one or more months) generally yield more accurate results. For continuous monitoring of radon levels, electronic alpha-track counters that display the radon levels and sound and alarm when high levels are detected are available, but more expensive at over 100$. Anyone who has sealed air leaks in their home should also be sure to re-test for radon, as reduced air flow can result in increased radon concentrations. New homes should be built with 'passive' sub-slab depressurization radon mitigation systems, these systems help to vent radon gas from under the home using natural air movement, and generally cost $400-1000 to install during construction. Another advantage to these systems is if radon levels are found to be elevated in the home after construction is completed, they can be easily converted into an 'active' mitigation system by adding a radon mitigation fan to help move the radon gasses away from the home foundation. Note : a licensed radon mitigation specialist must install the fan to meet state requirements. If you find you have high radon levels in your existing home, some steps can be taken to try and reduce the amount of air that contains radon from coming into your home. The primary way radon enters the home is through ground air infiltration. Putting an air-tight cover over your sump pit and sealing cracks along the floor of your foundation can go a long way to reduce radon levels. Making sure your stove vent runs to the outdoors and being sure to run the vent while cooking can also help to reduce radon levels and other indoor air pollutants. Adding an active mitigation system to an existing house is usually more expensive and less effective than adding the passive system during construction, and can range in cost from $800-$3000. Be aware- As of January 1st, 2008; if you have a Radon test performed in your home, you must disclose the results to any future potential buyer, because of a new state Public Act 095-0210 "Illinois Radon Awareness Act". Even if you don't test, you must include a signed statement saying that you don't know of any radon information, and include the pamphlet "Radon Testing Guidelines for Real Estate Transactions". This is the first of many postings regarding energy and resource conservation related news and tips from Chicago Energy Consultants. With all the things to be worried about in life, we could do much better at prioritizing what we direct our attentions to. From the moment we wake up it seems like insurmountable issues dominate all of our time, stressing us out and consuming more and more of our time every day. It is oftentimes hard to keep track of what is really important.. Basic Sanitation / Law / Peace: hard to say, but think hurricane Katrina and Iraq for recent examples of reduced life expectancy. Love / Companionship: you can remain alive without these, but you won't really be 'living'. Why is it seems that the more we need something, the less that we consider or value it? Air: Our homes, cars, planes, power plants and ships are fouling the air with an ever increasing volume of emissions. Globally, nations striving to reach our capitalistic heights are consuming with wild abandon their stores of natural resources. Research suggests that we spend 90% of our time indoors, yet amazingly, air quality inside the average home was found to be worse than that outside. Not a small feat in the Chicago metro area, as it currently ranks as the #13th worst in the US for small particle pollution. EPA testing has found that concentrations of gases called Volatile Organic Compounds (VOCs) were found to be 2 to 5 times higher inside than outdoor air. Water: Our astronomical amounts of trash have helped to form a garbage patch in the ocean estimated to be the larger than twice the size of Texas. Ocean currents carry our trash around in the sea for years, where it slowly breaks apart and accumulates, turning the sea into a plastic soup that kills ocean life. Runoff from fertilizer is choking our local lakes and rivers as we push farmland to produce season after season of corn due to biofuel demand, while before crop rotation and letting fields go fallow was adequate to restore nutrients to the soil. Clothes: We have our natural fibers cleaned with perchloroethylene (currently banned in California), a harsh toxic chemical that is not only damaging to the water supply, but "a probable human carcinogen causing a number of types of cancer". Food: We increasingly import more food from across the world, and many times food even crosses the globe 2-4 times during processing, packaging, and shipment. Mass production of food results in mass-contaminations resulting from poor practices during growing, harvesting, shipping, and processing. Shelter: We build our homes out of substances that off gas toxic fumes for many years. Many accepted building codes and practices create environments that trap moisture and can lead to toxic mold growth, as well as trapping radioactive gases that are as detrimental to our health as smoking. Things don't need to be like this.. and there are many simple things we can do as individuals to help to stop poisoning ourselves. Keep your eyes on Chicago Energy Consultants - News for new postings that will inform and educate on the many ways we as homeowners, neighbors, community members, and humans can help to make a difference in preserving life and the limited resources that are available to us all.